After weeks of Amazon Japan telling me I'd probably like these, I caved to low prices and proved that email advertising can work by buying these Yukiko and Chie Persona 4 the Golden Animation figures. As a fan of Persona 4 Golden, it's animated series (which I should probably finish reviewing someday) and Persona 3 (which I'm currently playing), these figures were an absolute must at the low cost of under $15 each. They're completely unique thanks to the Gekkoukan High Uniform from Persona 3 that they're sporting and don't feel low quality at all, despite the price. 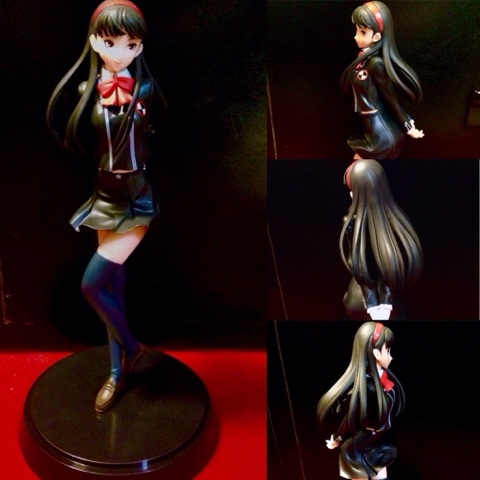 Yukiko's shy and feminine pose is appropriate for the lovely Yukiko. I love how her red headband matches the red on the Gekkoukan High Uniform and the black thigh-high socks add a nice, feminine touch. She looks beautiful and even fashionable an in the Gekkoukan High Uniform, possibly more so than her usual Yasogami High one. In contrast to Yukiko, Chie sports a strong pose and regular white socks, which are much more practical for her Kung-fu moves. I can totally see her busting out Kung-fu moves in this uniform, although the more sophisticated uniform does add a bit of femininity to Chie. She looks strong, but cute, which is perfect for Chie's energetic but caring personality. 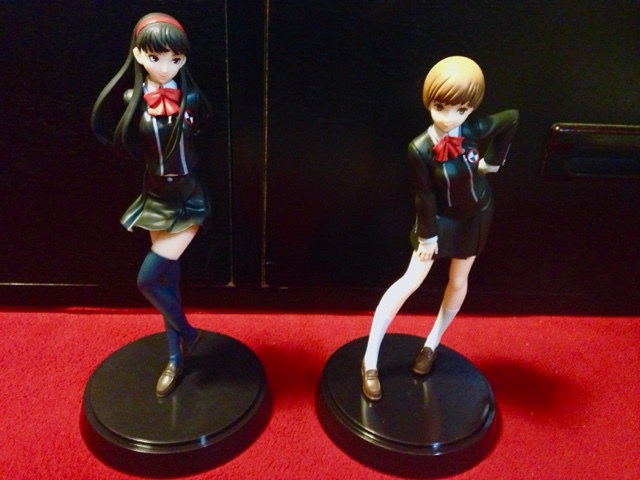 Chie and Yukiko's personalities clearly seem to been kept in mind for these figures and you can really see the difference in their looks and poses when they're placed beside each other. Since the two best friends are in the same uniform and have the same shiny black base (which, for the record, really likes to pick up fingerprints! ), the figures look best when displayed together. These two Persona 4 the Golden Animation figures are Prize Figures, which are usually made cheaper than other figures, I was pleasantly surprised with the quality, as I was with my Marie prize figure (also from Sega). Colours look accurate to the Gekkoukan High uniform from Persona 3 and the face details and uniform details are accurate, particularly the girl's eyes. Chie's hair even features a nice ombré-esque colour graduation, which is a good looking detail that looks like the way the sun would hit her hair. I bought both these figures brand new, but I did notice a scratch in paint on one of the black skirt parts on Chie's uniform. It's only small, but the figure was well packed in the box, so I'm guessing this happened before shipping. I stress though, it's very small and can only be seen close up so I have no issue with it. 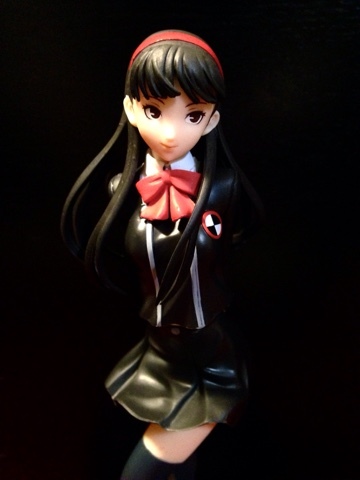 My Yukiko figure sports a perfect paint job with no imperfections. I was a little surprised and worried when I received my figures to see that the two figures featured slightly different boxes and packaging methods. While both boxes are extremely similar in box design, Chie's box is slightly different to Yukiko's in colour and also it lacks a Sega logo at the front. Inside the boxes, Chie was packed in a plastic packing shell, while Yukiko was wrapped in cardboard and bubble wrap. The reason the difference worried me was that missing logos and colour differences are usually a pretty good sign of something being a fake and I ain't interested in no fake figures! I seem to have nothing to worry about though, as looking on myfigurecollection.net and around Google Images, this seems to be the case for everyone else as well. So if anyone has the same worry, fear not, I think we're okay! Being cheaper prize figures, Yukiko and Chie feel above their price range and my quality expectations, with only one very minor imperfection found between the two figures. The outfits and poses look well thought out for both characters, with their personalities present in their poses and both are easy to display. 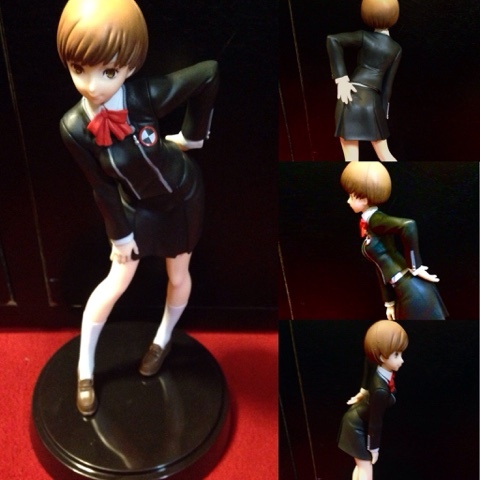 If you're a fan of Persona 4, these Gekkoukan High Uniform figures are one of the few outfit alternatives available for Chie and Yukiko, so are a great addition to any Persona 4 figure collection. 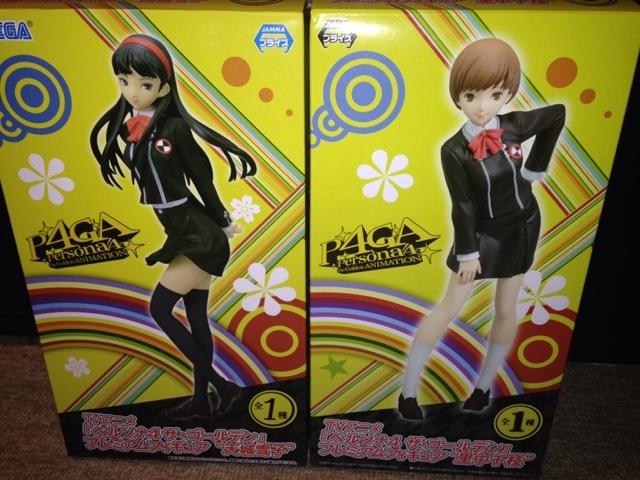 For fans of both Persona 3 and 4 or Chie and Yukiko, these are a must for the price. Unique and well-priced, these cute Yukiko and Chie figures are a good edition to any Persona 4 figure collection! Which figure do you like best - Chie or Yukiko? 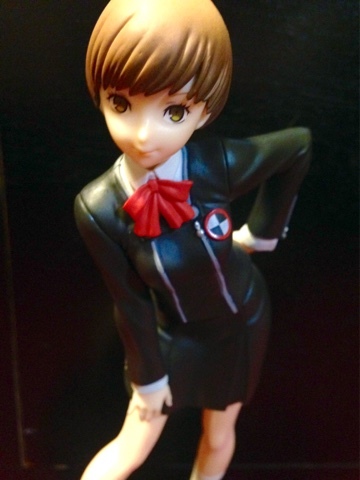 Also, if you have this figure or own other Persona figures, I'd love to see them so show me a photo of your figure collection!